These platforms are self-leveling and ideal for use when loads on the platform are likely to change. They can support up to 100kg and are available in a range of standard sizes from 60x60cm up to 150x90cm. Their low 6cm working height and low weight makes them ideal for use on desks and benches. These platforms are designed to be pumped-up and left alone. Simple to use, they are ideal for use with fixed loads or in applications where pressurised air or gas cannot be used. They support loads up to 100kg and sizes range from 60x60cm to 150x90cm with a 6cm working height. These passive platforms are weighted to 25kg and are for use with light instruments such as balances. They support loads to 120kg and are available in three sizes, 45x30cm, 40x50cm and 60x60cm. Their small footprint also makes them ideal for use when space is at a minimum. Working height is 6cm. The AMB Series pneumatic platform incorporates four 2Hz natural frequency rolling diaphragm damped isolators. The platform surfaces are manufactured from Pharma grade stainless steel, which is seamlessly welded, ground and finished along the corners to produce a perfectly smooth surface which can be cleaned thoroughly. Tuned dampening chambers and masses are incorporated to maximize stability and performance. 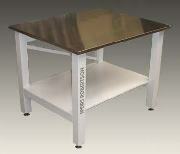 The table is simply inflated via adjustable valves using a standard bicycle pump. Sorbothane elastomer isolators have outstanding damping performance compared to isolators that use springs, rubber, or neoprene and so eliminate any rocking or wobble that is a major problem with other brands of platform. Sorbothane rapidly damps down disturbances to the microscope, such as when it is being touched during operation. It greatly improves image quality by protecting microscopes from both horizontal and vertical vibrations emanating from sources such as floors, walls and benching and caused by traffic, elevators, rotating machinery and numerous other sources. The seamless design and pharma grade stainless steel featured in the AMS series makes these tables ideal for use laboratories and cleanrooms and in Medical and Biological environments. The seamless design and stainless steel featured in the AMCU series makes these platforms ideal for use in laboratories and cleanrooms. 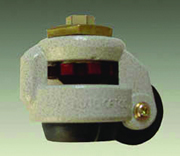 Integrated cushion air isolators remove 95% of vibrations. These platforms are specifically designed for high load applications and will support weights up to 1000kgs. Typical applications include large spectrometers, high-load weighing machines, and material testing machines. 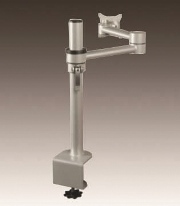 These light and compact passive platforms have been specially designed for instruments such as microscopes. Their T-shaped profile allows users to place their arms on either side of the platform while the width at the rear is large enough to support a wide range of instruments. The AMC Series is available in two different construction materials. Starting with the AMC-12, -12S, and 13, these platforms are made entirely from electroless Nickelplated aluminium parts and is suitable for Class 1 requirements. The top plate is 1cm thick with three damped isolators mounted to the underside. The AMC-7 platform is made from high grade steel parts welded together for rigidity and coated with a tough epoxy powder white finish. It is resistant to most forms of biological and chemical attack and isolators are simply removed making cleaning easy. The platform top plate incorporates three elastomeric isolators which remove over 97 percent of horizontal vibrations at 50Hz and over 95 percent of vertical vibrations greatly improving instrument performance. These isolators are available in two load ranges, up to 25kgs and from 25 to 75 kgs. Isolators are simply secured by a single thumbscrew and require no adjustments for varying loads. The new AM-DVIA series of active vibration isolation platforms feature high performance digitally controlled electrodynamic actuators and sensors which rapidly sense and respond to changes in position of the worktop to keep it precisely level and free from vibrations . A highly advanced electronic control system senses and responds to the smallest of changes in system parameters to remove problems caused by environment and noise, which limit the performance of sensitive scientific instruments. Only the on/off switch is required to operate the platforms. They are auto self -levelling and are auto-locking when moved. When switched on they maintain the working surface level and remove vibrations from as low as 0.5Hz to 100Hz Major disturbances settle within fractions of a second leading to higher rates of productivity being achievable. Applications are highly diverse encompassing: optical microscopy, electron microscopy (including AFM, SPM, Confocal, Raman, SEM and TEM microscopes) and associated products such as Ultramicrotomes. High resolution measurement instruments such as Interferometers, Profilometers and Micro Hardness testers and weighing instruments such as high performance analytical balances. Other applications high precision positioning systems and micromanipulation. Contact us at info@emsdiasum.com for more information regarding AM-DVIA Electronic Platforms including: M6x25 hole pattern worktop, 1/4-20x1in hole pattern top, Table for hood/platform, Arm rest bar for table, Table shelf, Keyboard shelf on table, Side tables, Retractable castor/feet, Monitor stands, and Temperature control.